We were scurrying around trying to get everything done. Jim and his crew of buddies were dealing with the stuff that guys usually take care of while I focused on the details and decorating. It seemed like we had been preparing for this day for weeks. Erin’s Sweet 16th Birthday Party. It was two o’clock in the afternoon. With only four hours left, there was still so much that had to be done before her guests would arrive. Centerpiece table decorations, final testing of the twinkle lights scattered all over our backyard, back-up toilet paper in bathrooms (funny – but true)…and the tying of the fuchsia pink sashes. That’s when it happened. During the tying of beautiful satin sashes. It was as if God sat down at the table…right next to me. 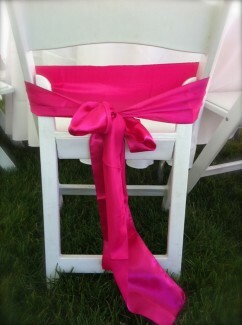 While I was feverishly tying a splash of pink all around the tent, He was there. Reminding me to enjoy the moment. So right there under the white tent filled with pink sashes and sparkle, I paused. While the hustle and bustle continued all around me, I stopped. And thanked God. For Erin…for the gift of life and breath…her life and the blessing of every moment that God has given to our family. And in that moment God gently reminded me that every good and perfect gift comes from Him…including pink satin sashes…the celebrating of turning sixteen…sunshine when the forecast said rain…and moments that turn into memories we never forget. …the gift is in the moment. I just got off the phone with a very dear friend of our family. He called asking for prayer. His wife is heading to Russia to bring home their son. His name is Luke. In less than two weeks he will start a new life with a new mom and dad. A new brother. A new home. A new everything. I could almost feel the love and excitement as my friend talked about little Luke. “He loves him already.” I said to myself as I grabbed my journal and started to pray. I don’t think it’s a coincidence that our pastor shared the riches of truth on this topic just a few days ago. So now I’m pondering over this again and I’m inviting you to do the same. God…the Creator of time and space and all that is, has chosen to adopt us (you and me…and little Luke) as His sons and daughters…through His One and Only Son, Jesus. I can’t even begin to wrap my mind, much less my heart around this. Before He created the world and all that is…HE already LOVED us. With jaded past, a life mess to unfold…He saw you; He saw me…and He loved us. Because of His beyond comprehension love we have been adopted into a forever family. A love that will never perish, spoil or fade away. And it was His pleasure. How can we not stand in awe of a God like this? A God who loves already…fully, perfectly, completely, forever. In Christ, you are His daughter/son. All of you…past, present, future. Little Luke isn’t perfect…but he is perfectly loved. Not because of anything he has done or didn’t do but because a mom and dad he doesn’t even know yet chose to love him already. This is the love of God. This is a grace freely given. When mom and dad open the door of their home in less than a few weeks and bring this precious child into all that God would have for him…he won’t have to earn his keep or prove himself in any way. All that they have will be freely given, all for him. He has been chosen and adopted. He is already loved. I hear the sound. And as I look out the window I see it. With windows cracked open it’s the sound that invites a brief nap. Nourishment for trees and plants that grow. The watering of the Earth that is His…all His. And as I listen and look, I’m thinking of you. I’m thankful for the blessing of words on paper that seem to matter only to me…until shared and read by strangers that become far away friends. Like drops of rain that fall upon needy ground. Taking it all in. Longing to be fed and nourished. 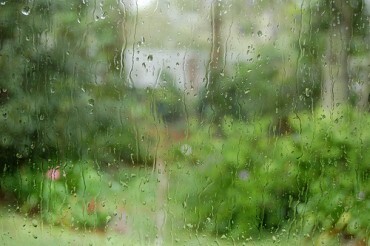 We long for the sun that shines bright and warms deep…but we need the rain. To break up the dry ground…and fill the emptiness, the cracks that expose and need mending. And so we take it all in…His Word…our words to each other. He said “everything”…which usually means everything…all things, excluding nothing. Let’s take a look at a few other Bible versions. Everything…all…renounce, surrender, give up…what is dearest to you…ALL. I’m a wreck over this verse right now. Here I thought my quiet time this morning was going to be quiet. You can’t read these words and not stop. And think. And pray! When Jesus said everything…He meant it. So what does this mean to me…to you? Have I given up everything? I long to be Your disciple. Actually, I think I am Your disciple but this verse freaks me out; it sort of scares me. If I’m uncomfortable and doubting right now, is this just my over analytical self or is this the searching of my heart that You’re so good at. Search me, O Lord…and know my anxious thoughts on this. Reveal the real me. What does this “giving up everything” look like? Is it…surrendering…my time, my rights, control, expectations, my agenda, comfort, money, time, talent, health, resources…ownership of everything? Does it mean answering the phone when I don’t want to? Being gracious to Jim when I’d much rather spout off at him in frustration? Listening to rather than just hearing what people are saying all around me – especially my children? Giving up? Holding on to everything loosely or not holding on at all? What does everything look like for you? 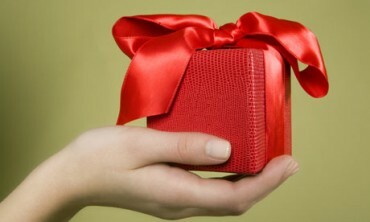 Does it look like a life all wrapped up in a pretty red gift box? Or is it all the not so pretty stuff too?